Spain is a formable nation that can be formed by any nation in the Iberian culture group, with the exception of Granada, who may form Andalusia instead. 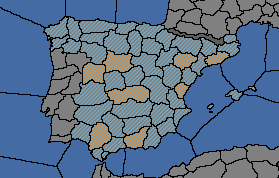 Owns the core provinces: Barcelona (213), Zaragoza (214), Valladolid (215), Salamanca (216), Sevilla (224), Toledo (219), València (220) and Granada (223). If duchy, set government rank to Kingdom. If a member of the HRE and not an elector / emperor, all own provinces are removed from the HRE. 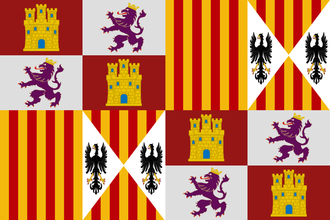 Aragon is a vassal of Castile or the junior partner of a personal union with Castile. Aragon has less than 32 cities. Castile is a vassal of Aragon or the junior partner of a personal union with Aragon. Castile has less than 37 cities. Has a legitimacy of 100. A Muslim nation does not own a province in Iberia. Castile has less than 40 cities. All orange provinces must be owned and cored to form Spain. Forming Spain grants permanent claims on the shaded area. Spain's missions focus on completing the Reconquista, projecting power into Italy and the Holy Roman Empire as well as expanding into the New World and the East Indies. If both Spain and France own provinces in Italy between 1490 and 1590, they are able to claim each other's lands, reflecting the Italian Wars that consumed the attention of these two rivals in this period. This event type will lead to worsened relations between the nations and a greater likelihood of war. The The Spanish State Bankruptcy events have returned, but only as flavor events if Spain actually goes bankrupt.